In the "Global Option", from "[General] -> [System Service]", Click the Setup...button in the option"Manage the system service of ftp server". In the dialog box showed in the picture below, click "Install Service". Another way to install Xlight FTP Server as Windows system service: If you installed the Xlight FTP Server from its installer(setup.exe), from Windows menu "Start->Xlight FTP Server->Administrate service", you will find the following menu. Using this menu, you can install and uninstall Xlight FTP Server as Windows system service. To install service - Select "Install as service" in the above menu, it will install Xlight FTP server as service and start the service. 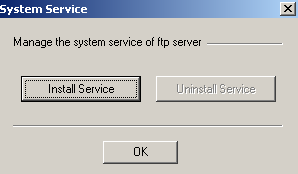 To uninstall service - Select "Uninstall service" in the above menu, it will uninstall Xlight FTP service and stop the service.